Monday saw Alan meet with Trish Nugent-Lyne, a collection manager at Whanganui Regional Museum. Te Papa staff are helping Trish prepare an articulated dog skeleton for an exhibition Whanganui Regional Museum is holding at the end of the year. The dog bones Trish brought were put into Te Papa’s dermestid beetle tanks to clean them. Alan examining a skeleton being cleaned by beetles. 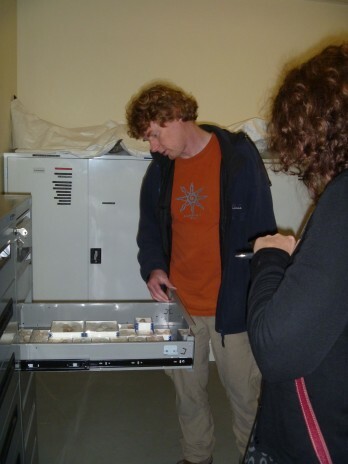 Alan also showed Trish through the vertebrate collections where they viewed other skeletons that she may borrow from Te Papa for their exhibition. They also discussed different storage techniques for fragile items such as eggshells. Alan and Trish looking at birds eggs in Te Papa’s collection. Te Papa has recently improved their storage method of these fragile items. Many researchers visit Te Papa, both from within New Zealand and overseas, to use the natural history collections for research. 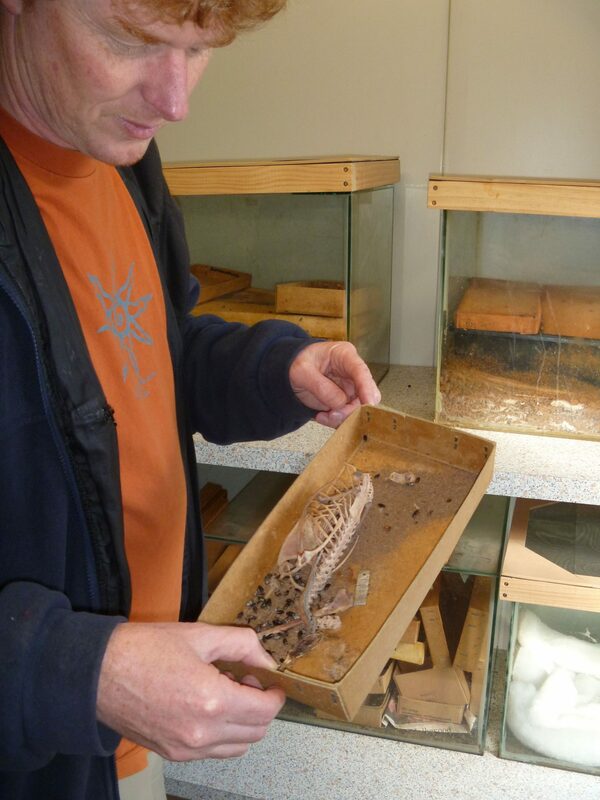 This week Alan communicated with a Chilean researcher who wants to visit Te Papa to examine pleisosaur bones. Last week was Primary Science week. During the week Te Papa curators and educators visited schools in the Wellington region. On Thursday Alan spent the day at Dyer Street School in Naenae talking to the kids about his job as a curator. The kids especially enjoyed seeing the moa bones and giant shark teeth that Alan took along and hearing about his fieldwork in Vanuatu. Alan was interviewed by Alison Balance from Radio New Zealand about the New Zealand Birds online project, led by Te Papa curator Colin Miskelly. Alan’s contribution to this website has been writing the texts for a number of living and extinct bird species and contributing photos. This week he worked on the final edits of some texts (the website goes live over Queen’s birthday weekend) and took photos of extinct penguin bones which will be displayed on the website. On Wednesday afternoon Alan attended the launch of a new fossil book at GNS in Lower Hutt. These types of events provide a great opportunity to network with colleagues working at other institutions. Te Papa receives many enquiries from the public, these are passed on to the appropriate curator to deal with. For Alan these types of enquiries typically involve identifying birds or fossils. However, this week Alan also responded to an enquiry wanting advice about restoring seabird sites in the Waikato. He also discussed developing legislation to prevent the sale of moa bones with the Department of Conservation. 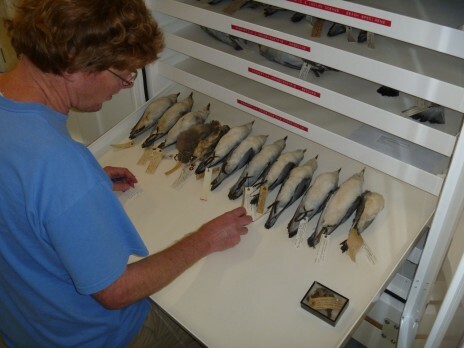 This week Alan assisted me with selecting prion samples from Te Papa’s bird skin collection for DNA analysis. Alan is part of the Te Papa seabird research team undertaking several projects into seabird taxonomy. Alan looking at a selection of Te Papa’s prion skins. This week Alan learnt that a team he works with in Adelaide have identified a couple of bat teeth from new species. These had been previously collected from the St Bathans fossil site in central Otago. Alan has been involved in excavating this site for the past 12 years. It takes many months to sort through the material collected in a single trip. 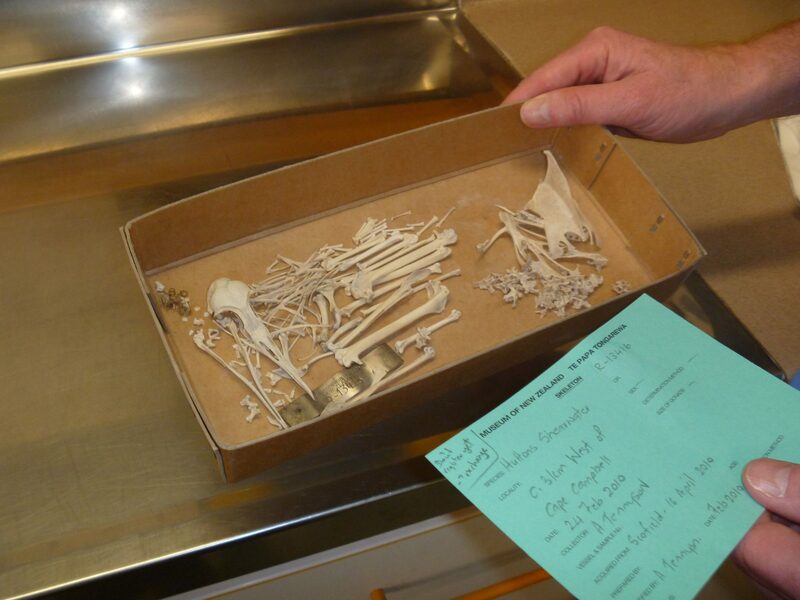 Further time was spent in the collections identifying bones from the Chatham Islands, including an extinct penguin, that had been donated to Te Papa. Alan also manages contractor Catherine, who prepares new bird skeletons, wings and tails for inclusion in Te Papa’s collection. He decides which specimens Catherine should prepare and the type of preparation each one needs. 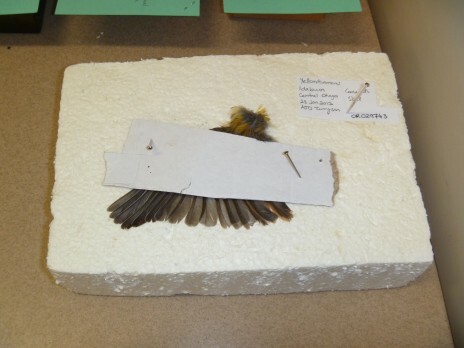 This involves checking both the condition of the specimens and seeing what is already held in the collections. Alan with a shearwater skeleton prepared by Catherine. A wing being prepared by Catherine for incorporation into the collection. Would love to see more regular updates and blog posts about the incredible natural history work you do & the collections you curate.